Welcome to the AAE 451 "Aircraft Design" course homepage for sections taught by Professor Crossley. This course offers senior-level undergraduate students the opportunity to participate in a capstone design experience focusing upon an entire aircraft. The student teams will determine specific requirements for, generate concepts for, and then select and develop a preferred concept for a future aircraft that will be profitable for scheduled "thin-haul" service and / or on-demand "air taxi" operators. Teams will identify a current baseline aircraft in a similar category to compare with their future concept, as well as to provide a sanity check and a means to exercise and validate their analyses. With a 2025 Entry-in-Service target, teams will need to make use of fairly well-developed technologies, but the competition allows for consideration of electric or hybrid-electric propulsion and autonomy. Trades are also available in aspects of the vehicle design, including passenger capacity, number (and type) of motor/engine. The teams will develop their own "sizing code" to predict the size, weight and performance of their preferred concept and will generate carpet plots as an approach to select the best values for major sizing variables. This public website contains basic information about the AAE 451 class, including contact information for the instructor and teaching assistant(s), the syllabus, and information about the design project for this semester. The class uses Purdue's Blackboard site to distribute handouts, collect reports, etc. 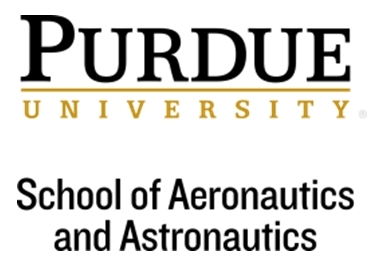 Students must register for AAE 451 and use their Purdue career account to access this information. This class schedule includes two “lectures” and one “lab” per week. The long lab sessions allow for design reviews, meetings between the design groups and the instructor, and individual quizzes. The class will also involve three evening sessions to allow for major design review presentations to off-campus review panelists; see the design project page for details.